Standing respectfully alongside Schuba’s Tavern, the Chicago institution that inspired its inception, Tied House is a modern celebration of the Lakeview neighbourhood’s historic icon. From the careful articulation of the neo-Gothic detailing in Schuba’s brick façade to the mirroring layout that orchestrates a contrasting arrival experience, Tied House is truly a reinvention of the storied music venue and bar’s legacy in modern, contextual form. Gensler Chicago worked diligently to create breathing room for the historically-listed tavern both literally and figuratively. The trellis-covered courtyard connects, and also separates, Tied House from Schuba’s, while competition between the two is mitigated through subtle tributes to the predecessor’s façade. Gensler’s Todd Heiser incorporated Schuba’s ornamental brick work into Tied House’s backlit brick screen exterior to immediately tie the story into the adjacent, new experience. 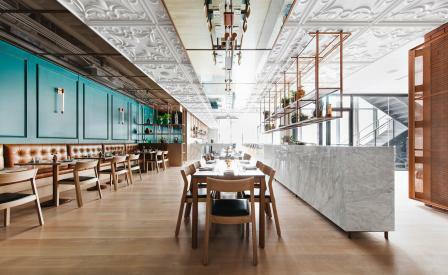 Inside, traditional tavern materials such as wood flooring, copper accents, and mosaic tiles sit beneath a network of oversized custom-moulded ceiling panels inspired by the pressed tin ceiling in Schuba’s. A colour scheme of deep evergreen, light ash, and stark white surround the calacatta gold marble central bar and create a sense of warmth and openness. Heiser layered in this palette to reflect the welcoming midwestern hospitality felt by many in years past at Schuba’s.